Marbles Yellow & White produces a sweep of 1 1/2" flowers in white and yellow, and 4 o'clock is about the time the striped, trumpet-shaped flowers open, suffusing the air with a sweet, orange-blossom scent. Plants attract hummingbirds by day and moths by night. Great for border or container. 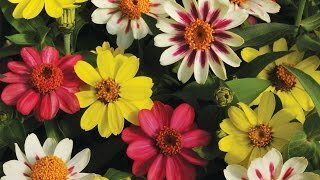 Plant in average, well-drained soil after last frost, and this annual will reward you with a summer full of colors. Four O'Clock, Marbles Yellow & White is rated 5.0 out of 5 by 1.